H+R have attended initial briefings at Clandon Park. We gave provisional consultancy on managed drying down of the structures and environmental monitoring, utilising our experience gained at Hampton Court Palace, Windsor Castle and Glasgow School of Art. We have achieved a prestigious commission at the Grade I listed Pitzhanger Manor, Ealing. Pitzhanger was the country residence designed by Sir John Soane for his own use. 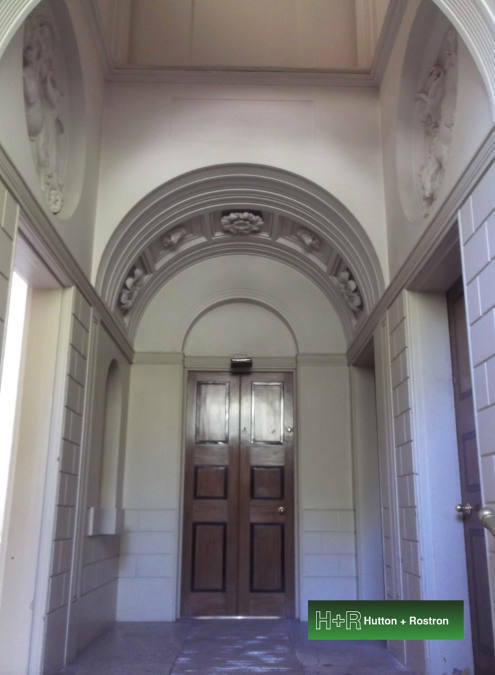 We will be undertaking a wide range of investigations, including flue mapping by Ground Penetrating Radar and specialist assessment of the cantilevered staircase and decorative plasterwork. Our developer client at Royal Star and Garter in Richmond has appointed H+R for two other residential projects which are being started on immediately. There has been an increase in demand for independent advice for problem resolution concerning contemporary new build projects for customer service departments of developer clients. This includes render failures, forensic investigation of poor detailing, leak detection and timber decay. Surveys are challenging as most of the units are occupied by new purchasers. From the present day back to the 15th century, one of our H+R surveyors has learnt a new skill and has been abseiling inside Winchester Cathedral to conclude the investigative work started in 2012 of the timber vaulted ceiling. One of our other church projects has had a long time lag. A second visit to All Saints Church on the Isle of Sheppey has been undertaken after our first visit which was in 2008! One of our surveyors attended the IHBC Annual School in Norwich this month. The experience was found to be highly interesting and thought provoking with an excellent calibre of speakers. Work has started again at Caistor St Edmund Roman Town in Norfolk, where H+R are providing contract administration services for the consolidation of parts of this ancient monument with funding from Natural England. Finally, one of our timber scientists began investigations in one of the oldest buildings in Bracknell; The Bull Inn dating to the 15th Century. It was found to be an interesting investigation with excellent examples of original timber framing.